Hi Ara, I love the pink! It kind of reminds me of the time I went to see LEGALLY BLOND the musical and 90% of the patrons were wearing pink. That was an awesome show, by the way, and if you ever get a chance, you should definitely go see it. I love live theatre because it was a play that first got me thinking I could be a writer. I never did finish writing the play I was working on, but it led me to writing other things which eventually led me to this new career as an author. Another reason I love live theatre is that you get to experience the performance with, or at least at the same time as the performers, rather than watching them on a screen. In CANVAS BOUND, my main character, Libby, has a few moments where she’s watching a performance and you get to see her emotions fluctuate the more she’s pulled into what’s happening on stage. This range of emotions then carries over into the following scenes and affects her as the story progresses. It’s that type of draw, or pull, I’m trying to capture with every line I write. I want my reader’s emotions to mirror the main character’s in such a way that they carry my story with them long after they’ve read the final page. I want to leave them eager for more and left longing when the final curtain falls. I’m pretty sure this is what all writers strive for, but being a newbie to this whole thing, I feel the need to prove myself in some way. I’m not saying I need to compare myself to the likes of Stephen King or J.K. Rowling, but every writer should have goals (read, dreams). So I work every day at perfecting my craft, trying to be the best at the thing I love to do most and hoping my readers enjoy the journey right along with me. If you’d like to share this adventure with me, you can find me on Twitter, Facebook and the web. Thanks so much to Ara for hosting me today! 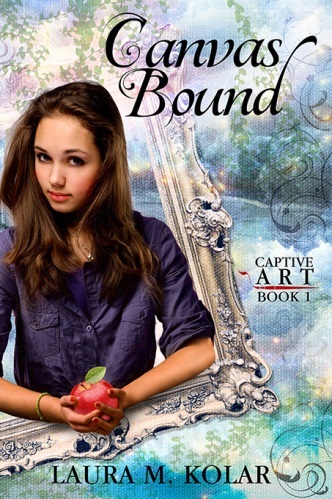 Laura is on blog tour today for her newly released YA fantasy book, Canvas Bound. Laura M. Kolar lives with her husband and daughter in a one-stop-light town in northern-lower Michigan. 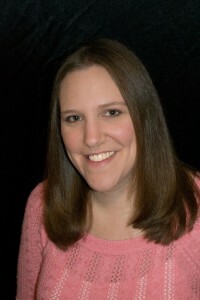 Though she didn’t discover her love of books until she turned thirty, as a self-declared hopeless romantic, she has spent the past few years reading and writing stories with mostly happy endings. If she’s not at her day-job or with her family, you will find her sipping a cup of chai latte while sitting in her favorite rocking chair, hunched over her laptop writing or spending entirely too much time on Twitter. Thanks for hosting this great giveaway. I love finding new authors.